The cepstralFeatureExtractor System object™ extracts cepstral features from an audio segment. Cepstral features are commonly used to characterize speech and music signals. Create the cepstralFeatureExtractor object and set its properties. cepFeatures = cepstralFeatureExtractor creates a System object, cepFeatures, that calculates cepstral features independently across each input channel. Columns of the input are treated as individual channels. cepFeatures = cepstralFeatureExtractor(Name,Value) sets each property Name to the specified Value. Unspecified properties have default values. Example: cepFeatures = cepstralFeatureExtractor('InputDomain','Frequency','SampleRate',fs,'LogEnergy','Replace') accepts a signal in the frequency domain, sampled at fs Hz. The first element of the coefficients vector is replaced by the log energy value. Type of filter bank, specified as either 'Mel' or 'Gammatone'. When FilterBank is set to Mel, the object computes the mel frequency cepstral coefficients (MFCC). When FilterBank is set to Gammatone, the object computes the gammatone cepstral coefficients (GTCC). Domain of the input signal, specified as either 'Time' or 'Frequency'. Mel –– The number of valid passbands is defined as sum(BandEdges <= floor(SampleRate/2))-2. Gammatone –– The number of valid passbands is defined as ceil(hz2erb(FrequencyRange(2))-hz2erb(FrequencyRange(1))). FFT length, specified as a positive integer. The default, , means that the FFT length is equal to the number of rows in the input signal. To enable this property, set InputDomain to 'Time'. 'Append' –– The object prepends the log energy to the coefficients vector. The length of the coefficients vector is 1 + NumCoeffs. Input sample rate in Hz, specified as a real positive scalar. Band edges of the filter bank in Hz, specified as a nonnegative monotonically increasing row vector in the range [0, ∞). The maximum bandedge frequency can be any finite number. The number of bandedges must be in the range [4, 80]. The default band edges are spaced linearly for the first ten and then logarithmically after. The default band edges are set as recommended by . To enable this property, set FilterBank to Mel. Frequency range of the filter bank in Hz, specified as a positive, monotonically increasing two-element row vector. The maximum frequency can be any finite number. The center frequencies of the filter bank are equally spaced between hz2erb(FrequencyRange(1)) and hz2erb(FrequencyRange(2)) on the ERB scale. To enable this property, set FilterBank to Gammatone. 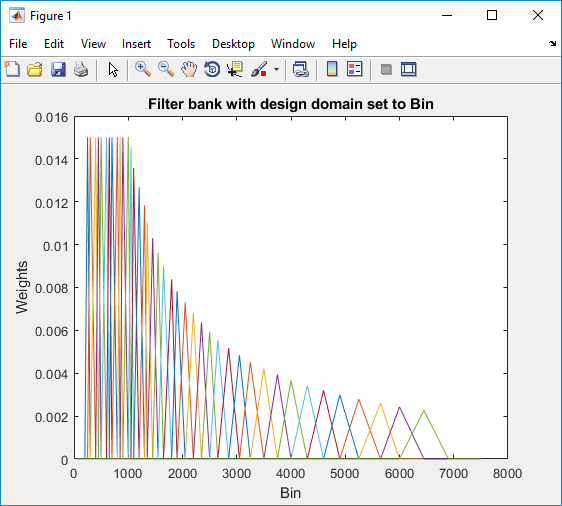 Domain for filter bank design, specified as either 'Hz' or 'Bin'. The filter bank is designed as overlapped triangles with band edges specified by the BandEdges property. 'Hz' –– Filter bank triangles are drawn in Hz and are mapped onto bins. Pass the audio segment as an input to the cepstral feature extractor algorithm to lock the object. Using the getFilters function, get the filter bank. Plot the filter bank. 'Bin' –– The bandedge frequencies in 'Hz' are converted to bins. The filter bank triangles are drawn symmetrically in bins. 'Bandwidth' –– The weights of each bandpass filter are normalized by the corresponding bandwidth of the filter. 'Area' –– The weights of each bandpass filter are normalized by the corresponding area of the bandpass filter. 'None' –– The weights of the filter are not normalized. [coeffs,delta,deltaDelta] = cepFeatures(audioIn) returns the cepstral coefficients, the log energy, the delta, and the delta-delta. The log energy value prepends the coefficient vector or replaces the first element of the coefficients vector based on whether you set the LogEnergy property to 'Append' or 'Replace'. For details, see coeffs. Audio input to the cepstral feature extractor, specified as a column vector or a matrix. If specified as a matrix, the columns are treated as independent audio channels. Cepstral coefficients, returned as a column vector or a matrix. If the coefficients matrix is an N-by-M matrix, N is determined by the values you specify in NumCoeffs and LogEnergy properties. M equals the number of input audio channels. 'Append' –– The object prepends the log energy value to the coefficients vector. The length of the coefficients vector is 1 + NumCoeffs. This is the default setting of the LogEnergy property. Change in coefficients over consecutive calls to the algorithm, returned as a vector or a matrix. The delta array is of the same size and data type as the coeffs array. In this example, cepFeatures is the cepstral feature extractor that accepts audio input signal sampled at 12 kHz. Stream in three segments of audio signal on three consecutive calls to the object algorithm. Return the cepstral coefficients of the filter bank and the corresponding delta values. delta2 is computed as coeff2-coeff1, while delta3 is computed as coeff3-coeff2. The initial array, delta1, is an array of zeros. Change in delta values over consecutive calls to the algorithm, returned as a vector or a matrix. The deltaDelta array is the same size and data type as the coeffs and delta arrays. In this example, consecutive calls to the cepstral feature extractor algorithm return the deltaDelta values in addition to the coefficients and the delta values. deltaDelta2 is computed as delta2-delta1, while deltaDelta3 is computed as delta3-delta2. The initial array, deltaDelta1, is an array of zeros. 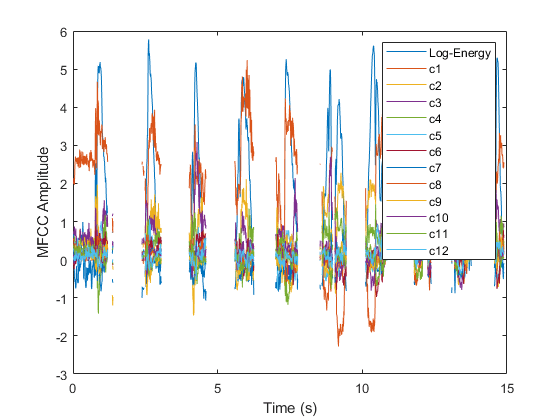 Extract the mel frequency cepstral coefficients and the log energy values of segments in a speech file. Return delta, the difference between current and the previous cepstral coefficients, and deltaDelta, the difference between the current and the previous delta values. The log energy value the object computes can prepend the coefficients vector or replace the first element of the coefficients vector. This is done based on whether you set the LogEnergy property of the cepstralFeatureExtractor object to 'Replace' or 'Append'. Read an audio signal from 'SpeechDFT-16-8-mono-5secs.wav' file. Extract a 40 ms segment from the audio data. Create a cepstralFeatureExtractor object. The cepstral coefficients computed by the default object are the mel frequency coefficients. In addition, the object computes the log energy, delta, and delta-delta values of the audio segment. The LogEnergy property is set to 'Append'. The first element in the coefficients vector is the log energy value and the remaining elements are the 13 cepstral coefficients computed by the object. The number of cepstral coefficients is determined by the value you specify in the NumCoeffs property. The initial values for the delta and deltaDelta arrays are always zero. Consider another 40 ms audio segment in the file and extract the cepstral features from this segment. Verify that the difference between coeffsTwo and coeffs vectors equals deltaTwo. Verify that the difference between deltaTwo and delta vectors equals deltaDeltaTwo. Many feature extraction techniques operate on the frequency domain. Converting an audio signal to the frequency domain only once is efficient. In this example, you convert a streaming audio signal to the frequency domain and feed that signal into a voice activity detector. 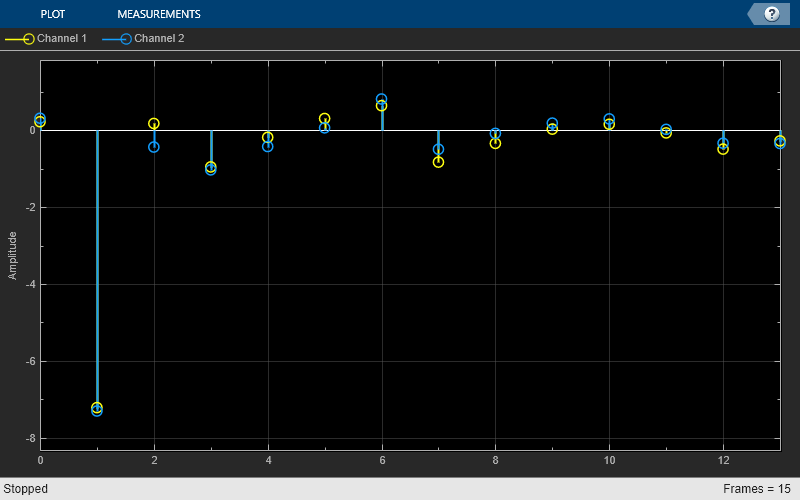 If speech is present, mel-frequency cepstral coefficients (MFCC) features are extracted from the frequency-domain signal using the cepstralFeatureExtractor System object™. Create a dsp.AudioFileReader System object to read from an audio file. Process the audio in 30 ms frames with a 10 ms hop. Create a default dsp.AsyncBuffer object to manage overlap between audio frames. Create a voiceActivityDetector System object and a cepstralFeatureExtractor System object. Specify that they operate in the frequency domain. Create a dsp.SignalSink to log the extracted cepstral features. Read one hop's of samples from the audio file and save the samples into the buffer. Read a frame from the buffer with specified overlap from the previous frame. Call the voice activity detector to get the probability of speech for the frame under analysis. If the frame under analysis has a probability of speech greater than 0.75, extract cepstral features and log the features using the signal sink. If the frame under analysis has a probability of speech less than 0.75, write a vector of NaNs to the sink. Visualize the cepstral coefficients over time. Create a dsp.AudioFileReader object to read in audio data frame-by-frame. Create an audioDeviceWriter to write the audio to your sound card. Create a dsp.ArrayPlot to visualize the GTCC over time. Create a cepstralFeatureExtractor that extracts GTCC. Extract the GTCC from the frame of audio. Write the audio frame to your device. Auditory cepstrum coefficients are popular features extracted from speech signals for use in recognition tasks. In the source-filter model of speech, cepstral coefficients are understood to represent the filter (vocal tract). The vocal tract frequency response is relatively smooth, whereas the source of voiced speech can be modeled as an impulse train. As a result, the vocal tract can be estimated by the spectral envelope of a speech segment. The motivating idea of cepstral coefficients is to compress information about the vocal tract (smoothed spectrum) into a small number of coefficients based on an understanding of the cochlea. Although there is no hard standard for calculating the coefficients, the basic steps are outlined by the diagram. Two popular implementations of the filter bank are the mel filter bank and the gammatone filter bank. The default mel filter bank linearly spaces the first 10 triangular filters and logarithmically spaces the remaining filters. The default gammatone filter bank is composed of gammatone filters spaced linearly on the ERB scale between 50 and 8000 Hz. 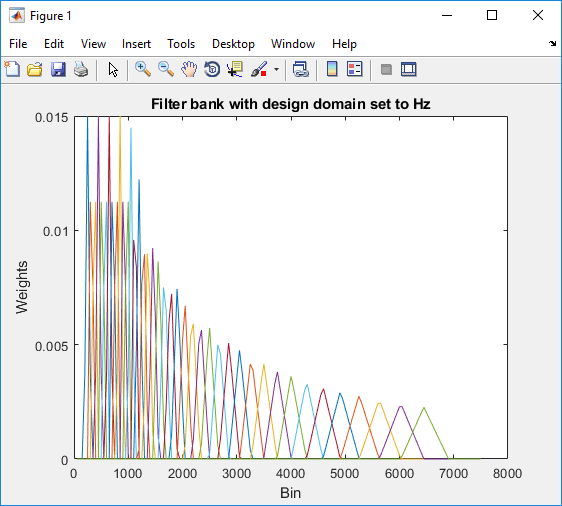 The filter bank is designed by gammatoneFilterBank.